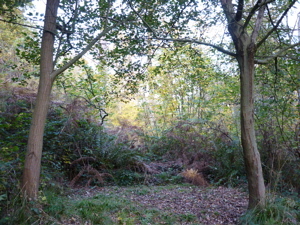 CLISSETT WOOD lies five miles north of Ledbury in idyllic Herefordshire countryside. Nestling just to the west of the Malvern Hills, the area still retains a truly rural character, with oast-houses, orchards and a wealth of timber framed buildings yet is within easy reach of Intercity rail services from London, Oxford and Birmingham and the M5 motorway. 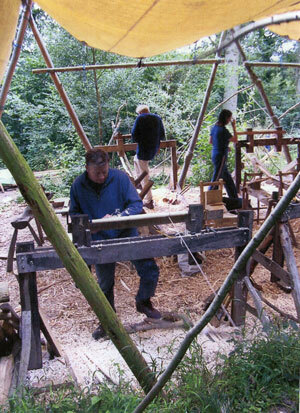 Gudrun Leitz is a founder member and joint owner of CLISSETT WOOD and has been offering courses from its purpose built workship since 1995. With its ten acres of mature ash and oak with hazel and sweet chestnut coppice, Clissett Wood is a place of great beauty and tranquillity. 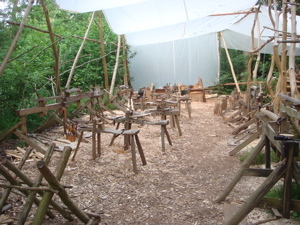 WORKSHOP There is a large well equipped woodland workshop where there is a pole lathe, shaving horse and a set of tools for each course member. There are also steam bending facilities, cleaving brakes and more. ACCOMMODATION & CATERING facilities in the woodland make Clissett Wood an excellent choice for a fully residential stay. 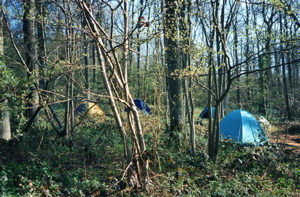 There are camping pitches (at £3.00 per night), basic greenwood shelters for those without tents (£5.00), a caravanning site at the Hopton Arms in Ashperton, or comfortable B&B's and self catering cottages nearby. 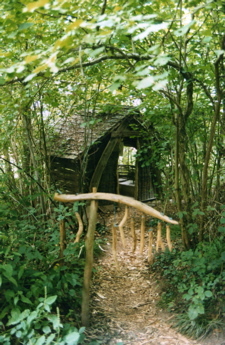 Running water, compost toilets, washroom and shower are all pleasingly integrated into the woodland setting. A hearty lunch is offered to those wishing to participate and contribute to a 'kitty' to cover costs. Tea, coffee and biscuits are provided at regular break times. 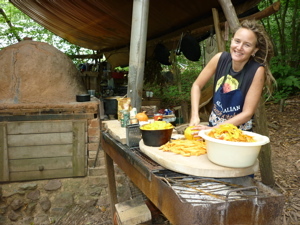 For breakfast and evening meals students cater for themselves, often taking turns to cook basic fare or amazing feasts over the open fire. 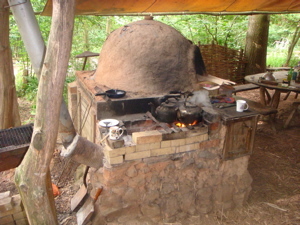 The kitchen provides all necessary cooking equipment, including a raised open fire (our 'eye level cooker') and a clay oven. Some good inns and restaurants are nearby. 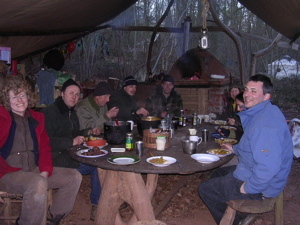 We offer eight camping pitches among the trees in the camping area for your own tent. Our four greenwood shelters provide a private sleeping base for singles, couples or friends sharing. 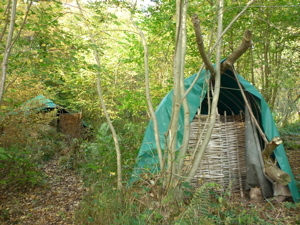 The shelters provide a pallet base and a good quality mattress inside. They can not be shut completely or locked. For shelters and tents you will need to bring your own bedding such as sleeping bags, sheets, pillows, duvets, hot water bottles etc.depending on the time of year. 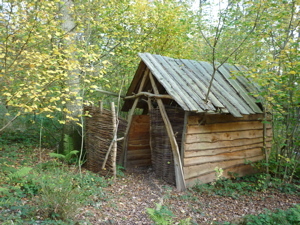 Also on site are a combined wash and shower room with running water and a well designed compost toilet along the track. 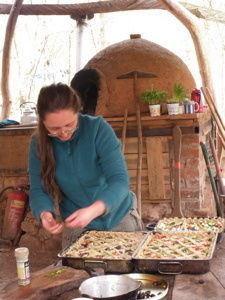 All cooking is wood fired; we have two open raised cooking fires which can be used to barbecue as well as general cooking and a wood fired clay oven for roasting and baking. Evenings are often spent sitting around a camp fire under the stars. 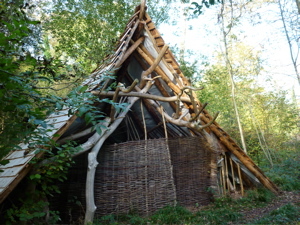 CHILDER WOOD and neighbouring MEEPHILL COPPICE are the base of Doug Joiner's 'Heavy Horse Centre' activities throughout the year. Timber for the courses in Clissett Wood is felled as part of the annual management plan and extracted by horse for delivery to the workshop.